Students from the Department of Psychology and Communication Department traveled to Texas A&M Prairie View for the 13th Annual Research Student Symposium on Nov. 3-4. The Pathways Student Research Symposium is an opportunity for undergraduate and graduate students in The Texas A&M University System across various academic disciplines to present their research findings in a poster or oral format. The symposium provides students with the valuable experience of interacting and discussing their research with faculty, judges and other participants. 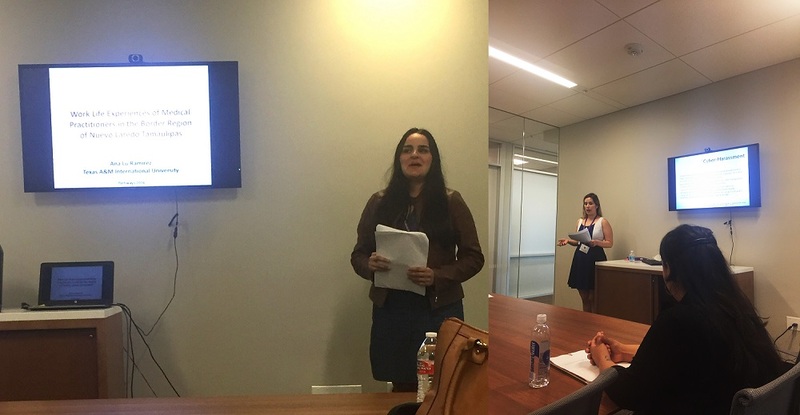 Among the Psychology graduate and undergraduate students who presented their research on Pathways were Dania Vaquera, Jonathan Briseno, Itzamara de la Cruz, Ashely Cavazos, Aileen Terrazas, Seven Flores, and Maria Partida. Graduate and undergraduate Communication students Melissa Santillana, Ana Luisa Ramirez, Stephanie Martinez and Victoria Mancha were also in attendance. Likewise, two professors from the department participated in the symposium as judges Dr. Stuart Davis, Director of the Border and Latin American Media Studies track, and Dr. Angelique Blackburn, Visiting Assistant Professor of Psychology.